The following points reflect on the history of Faridabad Majdoor Samachar (Faridabad Workers' News) and the political collective, Kamunist Kranti (Communist Revolution). These discussion points were originally presented in Hindi. We are grateful to the comrades who took the effort to translate them into English. We only had a little time to go through the translation and so we take responsibility for possible mistakes. We think the experience presented below is of interest to anyone or any group that grapples with the question of how our efforts to change the world should relate to changes in society in general and workers' struggles specifically. The Faridabad comrades' escape from the dead-end of leftist ritualism and dogmatism was only possible because the comrades are deeply rooted within the local working-class AND because they took the effort to reflect theoretically about their practical experiences AND because they reached out beyond their locality to form global links. Apart from sharing the history of a small collective, the points below also provide insights into the process of industrial restructuring during the 1980s and 1990s and the changes in working class struggles. 1. Education-upbringing in the 1960s and 1970s meant that one was to become a somewhat costly cog in the apparatus. But even without a clear political perspective one came across indecipherable situations, which raised general doubts about society. The declaration of Internal Emergency in June 1975  motivated to take the leap (out of the so-called education system and life how it had been before). 2. There was an absence of considered ideology. There was no experience of voluntary membership of any organisation. But the opposition to the Internal Emergency by those political-social ideas and organisations with whom there was a little acquaintance seemed superficial. The real opposition was said to be the Communist Party of India (Marxist-Leninist). 3. Revolutionary organisation. Ruthless suppression by the state apparatus. Indispensable necessity of secret organisation for security. Searched. Established contact. Eager for the role of professional revolutionary. No dispute with the family and broke relations with the family for the Protracted People's War. 4. In view of rawness (of the situation and also in terms of inexperience) and concerns for security, there were not many questions raised within the organisation. Obsession for practice. CPI (ML) had split into many groups. Some basic premises: Mao-thought showing the path; India is a semi-colonial and semi-feudal society; Protracted People's War is the path to liberation; a united front of waged workers, peasants, petty bourgeoisie and national bourgeoisie needed to confront the feudal-comprador bourgeoisie imperialist alliance; tribal people/areas-forests-hills-rivers create base areas; producing professional revolutionaries is important. 5. Some experiences in the hills-forests on Rajasthan-Gujurat border and in the Kund-Kunwari-Chambal area in Madhya Pradesh. Motivating engineering college and polytechnic students and unemployed graduates to become professional revolutionaries through political propaganda. The complete absence of organisation in these areas was filled with hyperactivity. Obsession of roving revolutionary. Becoming one with the people. 6. Mao's death in 1976. More splits in Maoists divided in groups, support for Mao's wife and opposition to Deng. The victory of Deng in the power struggle in China. Suddenly at the end 1979: ‘Beginning with peasants is completely wrong, start with wage workers’. 8. All major textile mills in Indore had either shut down or were close to shutting down by 1980. Older textile workers who had broken from the CPI made arrangements for us in terms of accommodation and political discussions. Through their own mobilisations, the textile workers of Indore had sent a CPI leader into Parliament. After the CPI had supported the internal Emergency, the very same workers made him lose his security deposits in the 1977 elections (in order to stand in elections a candidate has to provide a security deposit and only a huge loss of votes can result in losing this deposit). During the internal Emergency the police were sent into the factories to threaten the workers to make them operate 4 instead of 1 machine each. The textile mills of nearby Ujjain were also close to shutting down. The only factory in Dewas was a steel tube factory whose manager was an ex-CPI member, who when we met, asked us to stop going on about the revolution and to work for the betterment of workers. At that point, the Pitampura industrial area of Indore had still not been established. In this situation political engagement started with the older active workers and the workers of the smaller factories in the new industrial area. 9. People who had come from Bharat Heavy Electricals, Bhopal to meet friends in Indore, insisted on organising political activities in BHEL. They made all the arrangements for the stay. A study of Lenin's works during this period had prepared the groundwork: workers on low wages raise economic demands even during a revolutionary upsurge, while high-waged workers raise political demands. 11. In addition to discussions with BHEL workers, there was a lot of travelling to other parts of Madhya Pradesh. A meeting with Shankar Guha Niyogi  in Dalli Rajhara  took place in 1981. Went to Dalli Rajhara again after his arrest and from there together with a worker comrade to Sagar to meet Niyogi in jail. 12. Read a bit of Marx and a lot of Lenin in 1981. The 1890-1900 debates between Narodism and Marxism in Russia showed that the Marxist-Leninists here were rather taking the Narodnik line. The importance of organisation, and the significance of a programme for an organisation was the motivation to draft a programme. A draft for the “Marxist-Leninist Majdoor (Wage Workers) Party” was written. Only one issue of the “Majdoor” newsletter was published. 13. It was a secret organisation. Interactions were held in ways devised during Maoist times. Delivered the draft programme to the party leader in Delhi in January 1982. This caused a state of disorientation on his part: forty years in the communist movement, he had been important in the CPI, a Central Committee member of the CPI (M), a Politburo member of the CPI (ML).... and this novice dares to give me a counter draft! Charges of forming another party were put forward. As a result, the relations with the party were cut. 14. What was wrong in putting forward a draft programme? Clarification seemed like an unnecessary expense of energy. Practice alone would bring the hidden weaknesses (of the old party formations) to the fore. Decision not to return to Madhya Pradesh. Some experience in Faridabad and the adjoining Mewat region had been gathered during the internal Emergency. From a Leninist point of view, Faridabad had strategic importance as the foremost industrial region in North India, and being situated so close to the capital, Delhi. If one has to start from scratch then one might as well begin here in Faridabad. Conditions will definitely give birth to a revolutionary organisation; till the moment of joining that organisation arrives, the decision was made to work in Faridabad as per the draft programme of the ‘Marxist-Leninist Majdoor Party’. In difficult circumstances, the monthly publication of Faridabad Majdoor Samachar was started, by taking financial help from a friend from student days. 15. Faridabad's New Town was established for 40,000 of the refugees who came from Pakistan after its formation in 1947. An industrial area was established nearby which provided employment. Factories like Bata, Brown Boveri (ABB), Government Press, Lakshmi Ratan Engineering among others were set up. Because of militant mass unrest in Bengal, in 1967 many factories were shifted from there to Faridabad. Connected by The National Highway 2, major railway lines from Delhi to Mumbai and Chennai and closeness to the capital Delhi soon made Faridabad the foremost industrial centre of North India. Goodyear Tyre, Pratap Steel, Star Wire, JCB, Hyderabad Asbestos, Hindustan Syringes, Porritts and Spencer (Voith), East India Cotton Mill, Hitkari Potteries, Hindustan Vacuum Glass, Gedore Hand Tools (Jhalani Tools), Escorts, Metal Box, Thomson Press, Talbros, Havells, Usha Spinning and Weaving Mill, K.G. Khosla Compressor, Jagsonpal Pharmaceuticals, Super Fashion, Kelvinator (Whirlpool), Avery India, Thermal Power House… Hundreds of thousands of workers from nearby areas and places fifteen hundred miles away engaged in various sectors of production in this new industrial centre. 16. Plans were made for factories and the provision of houses for managers and supervisors – sectors were designed. The government acquired peasants' land very cheaply. Peasants and artisans from nearby villages became workers in these factories. There was no provision for housing in the policy and plan for the hundreds of thousands of workers employed in these factories. Forcing workers to set up slums near railway lines, open drains and on uneven, unused land is the political economy of reducing expenditure on housing. In 1947 companies gained independence from the responsibility of providing for workers' housing. The Faridabad model of not providing for workers' housing was replicated in the Okhla Industrial Area, NOIDA, Ghaziabad and Gurgaon – all areas that are part of Delhi’s industrial belt. 10. During wildcat strikes in Gedore Hand Tools from 1963 to 1973 , the police had to withdraw repeatedly in the face of workers’ spanner-shaped missiles. In order to suppress strikes in East India Cotton Mill in 1969, the police picked up and then dropped off workers in unknown regions near Rewari, a desert-like area around 40 km from Faridabad. Strike at Escorts. Police firing on Goodyear factory workers. Management was able to exercise a degree of control over workers with the help of an AITUC union in East India Cotton Mill , a CITU union in Gedore Hand Tools and an HMS union in Escorts. 19. Immediately after the lifting of the Internal Emergency, workers of the East India Cotton Mill removed the AITUC leader who was openly with the management, and owing to lack of options hoisted the BMS flag. A strike was staged on the issue of increasing the bonus from 18% to 19%. Seven thousand workers went on strike while the management kept a few hundred inside the factory. It got pretty violent. There was an attempt to replace the BMS flag with an HMS flag. Police opened fire in October 1979. The strike failed. Years later we tried to scratch the surface to understand what had happened: instead of a worker operating one machine, they now operated four machines in weaving; table printing had been replaced by rotary printing etc. Changes in the production process had made 4000 out of the 7000 workers redundant. All those workers were permanent. How could management throw them out in one go? A strike for 1% increase in bonus and the haze of a beaten strike hid the fact that 4,000 jobs had been done away with. After the strike, one worker started operating four-six-eight machines. By 1996, the East India Cotton Mill had shut down altogether. Usha Spinning & Weaving Mill in Faridabad had already shut up shop. Textile mills in Indore had closed aswell, as had the ones in Ujjain. The same in Kanpur. And textile mills in Delhi. Where did the 250,000 workers employed in 60 textile mills of Mumbai go? In India cloth production within the state sector has increased massively in the last 25-30 years, while composite textile mills have all but disappeared. At the time of important changes in the production process it seems necessary to reexamine the role of instigations and 'militant' reactions. 13. The first issue of Majdoor Samachar (Workers' News) was published in March 1982. Because of registration related issues, the name had to be changed to Faridabad Majdoor Samachar. A one-page monthly, one copy costing 25 paisa. It was a Leninist paper: the indispensable necessity for the organisation of a political party of the working class; exposing fake communists; through naming the ‘World Bank’, exposure of the loot of oppressed countries by imperialism; trade unions are workers' organisations and in place of their comprador leaders work to establish real workers' representatives; attempts to unite workers; criticism of the parliamentary method, using a Maoist tone. A complete turn away from the role of a roving revolutionary and complete focus on workers' activities in the factories in Faridabad. A great importance given to studying Marx, Engels and Lenin's books – to that end a Majdoor Library was set up. The Communist Manifesto, State and Revolution, Origin of Family, Private Property and State, Capital… The ABC of the Worker, Gorky's Mother etc. were read and discussed. Hyper-activism around the newspaper. Getting pushed around, having the newspaper and pamphlets snatched, scuffles. AITUC-CPI, CITU-CPM, BMS, HMS, and the ex-Maoist groups spread rumours in opposition to us. 21(a) 3600 workers worked in the three plants of Gedore Hand Tools. Gedore's headquarters were situated in Germany and their products were supplied to car manufacturers in the USA. There was a slump in the auto-industry, and competition with companies in China and South Korea intensified, automation in electroplating was on the agenda… inside the Gedore factory a CITU union had a militant image. Although Faridabad is in the state of Haryana, due to its importance as a stronghold, the CITU-CPI (M) kept the Faridabad state branch in their Delhi state Committee. The president of the Gedore union was also the CITU president in Faridabad. In June 1982 after talking about the world crisis in a general body meeting of the Gedore workers, the CITU leader put forward three proposals for the workers to chose from: (i) 600 workers leave their jobs voluntarily; (ii) all workers accept a 25% wage cut; (iii) workers go on extraordinary leave ("special leave") for six months. CITU leaders had dominated in the factory since 1973 and the possibility that anyone could oppose them did not even enter their thought. The workers rejected all three proposals. Comrades active in Gedore brought out a pamphlet in the name of six workers raising questions about the role of the (CITU) union. Inside the plants some of the workers were silenced by threats, while outside the CITU union kept mum. The Gedore management responded: workers should not get mislead by disruptive forces – the management has no intentions of retrenching workers. The company issued warning letters to those workers that the union had failed to silence. The company's redundancy plan got stuck because it was brought out into the open and was being discussed by the factory group and Majdoor Samachar. In order to regain its militant image, the CITU union called for a tool-down strike in 1983. Because of constant discussions among the workers regarding lay-offs, the CITU leaders got trapped by calling the strike. The agreement that was reached after a month of tool-down strike was rejected by the workers. They also rejected the second agreement. When the tool-down of 3600 workers in three plants had lasted nearby three months, the union leaders came up with a third agreement. CITU supporters brought from other factories were also seated amongst the workers. The agreement was read out and was rejected by the workers. But as per the plan, the CITU leaders and their supporters rushed inside the plants and switched on the machines. The leaders had hoped that after hurling some abuse, the workers would go to their plants. But the workers of all three plants chased down the union president and general secretary and thrashed them; the leaders ran away; the tool-down strike continued. The CITU leaders were forced to hand in their resignation. There was a heavy police presence, a struggle committee could not be formed and instead a new union leadership was constituted, production restarted in the plants. Retrenchment plans had to be shelved until further notice. The management brought back the CITU leadership. Workers were beaten up inside the plants and forced to sign resignations. There were physical attacks on the way to and from the factory – workers were forced to sign their resignation. The police camped in tents inside the plants. At that time, wages in Gedore were higher than those at Escorts. Many workers had their bones broken. Suicides. It took over a year to throw out 1500 workers. Workers were also thrown out of factories in Kundali, Aurangabad and Jalna – the company called it a “voluntary separation” of 2300 workers. This marked the death of CITU in Faridabad. 21(b) There was an AITUC union in the Bata shoe factory. In the long-term agreement signed between the management and the union in 1983, a "trial" to replace semi-automatic lines with automatic lines was agreed. Faridabad Majdoor Samachar raised the issue. The AITUC-CPI leaders were so offended by the discussion that the outcome of automation for Bata workers would be redundancies that they brought out a handbill praising the agreement and denouncing those who opposed it as imperialist agents and anti-union elements. Declaring the trial-run successful, the management installed fully automated lines. Seeing the danger of large-scale redundancies and in view of the management-union role, the Bata workers took collective steps. Despite repeated efforts, we still do not how the workers managed to produce less on automatic lines than they did on semi-automatic ones. The management cut workers' wages. No new leaders came to the forefront against the old union leaders. The workers gave the company no targets for its attack. Reduced production and wage-cuts continued for a year-and-a-half. In 1985, management dismantled the automatic lines and re-installed the semi-automatic lines. 21(c) Swaraj Paul, a close associate of Prime Minister Indira Gandhi, based in London, secretly bought some shares in Escorts and DCM. He said that his aim was to break the feudal hold over industry in India and establish professional management. At that time, Escorts was one of the ten major industrial companies of the region. 54% of Escorts shares were with the state-owned Life Insurance Corporation (LIC). 15% of the money invested in Escorts was from shares while the other 85% was from loans – this loan money came largely from state-owned banks. The Nanda management/family had only 4-5% of the total shares. So whether Escorts management would be dominated by Nandas or by Swaraj Paul was going to depend on the decision of the political leadership. To stop Escorts and DCM from falling into Swaraj Paul's hands, JRD Tata and others met the Prime Minister. Escorts had an HMS union. The union was openly supporting the Nanda management and opposing Swaraj Paul. At that point the Congress Party was in power in Haryana. In support of Swaraj Paul, the state government established an INTUC (Congress) union in the Ford plant of the Escorts group – a worker leader with a Maoist background became the general secretary of the INTUC union. At the time of the fight between Nanda and Swaraj Paul, the unions tried to mobilise workers in favour of this or that management faction. 22. Studies have brought to the fore the fact that whether it is Tata Steel or Hindustan Motors, those who were in management had put in less than 0.1% of the total capital invested in these companies. And yet, Tata, Birla, Nanda, Bharatram, Bajaj, Kirloskar were called owners and behaved like owners. Prime Minister Indira Gandhi's death meant that Swaraj Paul was not allowed to have control over Escorts and DCM. But the importance of political leadership had been very clearly shown and no scope was left for any questioning of the political leadership's share. In India the differences between state companies and private companies were insignificant. 23. INTUC was known as the companies' union – or yellow union. After 1977, BMS, too, gained a similar reputation. In various factories in Faridabad, unions of HMS, AITUC and CITU were directly seen to be yellow unions. Factory-based independent unions were also found to be like INTUC. Three-year, long-term management-union agreements were found to be means of increasing exploitation and consolidating control. During times of major attacks on workers, the role of unions in Faridabad was found to be even more dangerous. Many meanings of the word ‘strike’ came to the fore: a ritualistic strike, a fake strike, an engineered strike as way of instigation, a real strike. Where there were unions, workers' wildcat strikes that sidestepped unions seemed like real strikes. The bitter experiences of union-sponsored or union-led strikes in Faridabad and elsewhere were reflected in this kind of data, too: lockouts accounted for a greater loss of workdays than strikes. And CITU's leaders answer when over a thousand workers signed a petition and demanded union elections? They said: Do elections take place in communist countries?! The papers with signatures were torn up and the worker who had gone to hand them over to the leaders was beaten up. 25. The International Communist Current opened the doors to the German, Dutch and Italian Left. The essays of Paul Mattick  and booklets from Solidarity  raised many questions. The premises of the International Communist Current regarding nation, parliament, and trade union seemed correct to us. But if Lenin's theory about imperialism was not to be the basis, what in its place? How to understand the production and reproduction of social life? What is the critique of political economy today? The premises of the draft programme of the ‘Marxist-Leninist Majdoor (Wage Workers') Party’ had become shaky. After publishing the basic premises of the International Communist Current in the 25th issue, the 26th issue was a handbill, the publication of Faridabad Majdoor Samachar was stopped in mid-1984. From hyperactivism to a static-like situation. What and how to do things without new premises? 26. We got to know of Rosa Luxemburg's The Accumulation of Capital through the International Communist Current. In the very beginning Rosa clearly states that Marx's exposition of the extended reproduction of capital in the second volume of Capital is wrong. This analysis of Marx contradicts Marx's own basic premises that capital has objective limits. It seemed ridiculous that in this situation the International Communist Current stated that Marx and Luxemburg are saying the same thing. It felt like they were repeating mantra-like 60-65 year-old formulas. 27. The three volumes of Marx's Capital were available. Owing to adverse financial conditions we had to prepare a hand-written copy of The Accumulation of Capital. Thinking and rethinking the three volumes of Capital and Luxemburg's Accumulation took the form of an obsession. This took more than a year. Against Luxemburg's book written in 1913, there was then Bukharin's reply (1923)  wherein basing himself on the analysis of Marx he proves that state capitalism will be crisis-less. 28. We published our conclusions in 1986 in Hindi as well as in English in a new publication called Kamunist Kranti. This publication was “an attempt to participate in the constitution of the World Communist Party". On the question of organisation, instead of Luxemburg it was the practice of Lenin that became a point of departure and regarding the critique of political economy, Luxemburg seemed to complete Marx. On the basis of the premises of Kamunist Kranti, the new series of Faridabad Majdoor Samachar was started in 1986. 29(a) Recognition of the difference between simple commodity production and capitalist commodity production, i.e. the difference between production for the market using personal and family labour and production for the market based on wage labour is important. In the context of the Indian subcontinent, the East India Company  was representative of the merchants. In the place of feudal and other natural economies, the East India Company imposed commodity economy, simple commodity production economy in India. If there was any production at all based on labour by wage workers in England in 1757, it was very marginal. The East India Company was not a representative of capitalism, of capitalist commodity production. The East India Company took the products of peasants and artisans in the sub-continent to sell them in Europe. 29(b) Along with similarities, differences between new value and surplus value too are important. Peasants and artisans produce new values out of which moneylenders, traders and the state take their shares. Artisans and peasants do not produce any surplus value. The new value produced in wage labour-based commodity production is what is surplus value. 29(c) Besides capitalist commodity production, the presence of simple commodity production is an indispensable necessity for the accumulation of capital. And, the process of capital accumulation keeps on swallowing up simple commodity production. It is thus that capital moulds the world in its own image. 29(d) Capital is a social relation. Capital has no nationality. The process of capital accumulation established the railways in the USA using resources produced in England, and thus "England" created its own competitor. Setting up of the railways and textile industries in India from the resources produced in England established competitors for industries in England. 29(e) The Zamindari system  set up by the East India Company had nothing to do with feudalism. The extraction of rents in cash instead of in kind accelerated the expansion of production for the market. 29(g) “Jati” and “varna” are different things (often subsumed under the notion of “caste”). There are four “varnas” and these can be understood as an attempt at class division. There are thousands of “jatis” in the Indian sub-continent. There are many “jatis” in the same profession. “Jatis” can be understood as genus (gana), tribes and clans. To claim that jatis were born in feudalism is to deny facts. 29(h) Even in 1860, the private ownership of factories was becoming hard to sustain. Five to ten percent stakeholders were becoming owners of the factories. By 1890, this became the dominant form of factory ownership. Soon enough, the place of ten to twelve shareholders was taken by thousands of shareholders. And then, while 10-15% of the total investment came from shares, the remaining 85% or so came from credit. To call a company or factory private property only obfuscates the reality. Chairmen/managing directors are not owners of companies. And to accept state-owned companies as public sector enterprises is also a step forward on the path to doom. 30. Expenses for one year (for printing the newspaper and sustaining comrades who worked for the newspaper full-time) were taken from a friend and it was hoped that economic/financial problems would not be there after a year. Active comrades working in factories contributed Rs 25 each month and Rs 100 at the time of annual bonus payment. On looking back, these were significant amounts. The success of our intervention in the Bata factory and especially in the Gedore factory disturbed our economic situation. There were additional expenses due to physical attacks and handbills - our formula was: we will take every issue, e.g. regarding attacks on workers, and raise it amongst workers and workers will be the ones who decide. Some worker comrades were not paid wages for three months in 1983. A worker comrade who had become a professional revolutionary was temporarily sent back to his village - money could not be arranged to call him back. At many places in Faridabad during morning shifts Majdoor Samachar was sold by groups and more than 650 copies were sold each month. Stopping the publication of the paper and reflecting on Marx-Luxemburg-Bukharin further increased the financial difficulties. Passing through the de-classification process during the Maoist period was very useful (for surviving on little to nothing). Expenses were minimal. Still, tuition work had to be taken up for the publication of Kamunist Kranti and then paid translation work for financing the new series of Majdoor Samachar. 31. We looked for people with whom we could discuss our doubts and questions regarding the critique of political economy. We were unable to find anybody who had read all the three volumes of Capital. The publication of Kamunist Kranti had increased the number of contacts in the world. Some people came to meet us in Faridabad and in private discussions they accepted the importance of the questions raised in light of dozens of Marx's quotes from Capital but publicly they continued to call "the tendency of the rate of profit to decline" as "the law". Not just in the Left, but within the ultra-Left too, the sense of insecurity ran deep. They didn't have any answer to the questions on their basic premises, but they stuck to them, because there was a fear that doubt will lead to doom. The tragedy for the Left and ultra-Left was that the social discontent that had been increasing over generations was once again being expressed through religious etc. currents. This was partly due to the bankruptcy of the state capitalist currents within the Left. 32. Persons from a Maoist students' organisation contacted us with lots of questions in 1987. In 1988, Kamunist Kranti's second issue was published and various contacts in India were invited for discussion on ‘The Fundamental Question before the Marxist Communist Movement’. Friends from many places arrived. Most of the participants were unaware of the activities of factory workers. There was an almost total absence of any depth of acquaintance with Marx's Capital. Dr. A.P. Shukla from Kanpur said that it wasn’t possible for him to read Capital at this advanced stage of his life. Of course, a group of students-youth became active, a new energy dawned. 33. Our interactions with self-proclaimed revolutionary organisations and revolutionary currents in the world, but especially in India, increased. After some experiments in 1986-87, from December 1987 a regular publishing of Majdoor Samachar began. A series of study circles were initiated with renewed energy. And, in 1989 Majdoor ka ka-kha-ga (‘ABC of a worker’) became a material for pedagogic discourse among workers in the form of Sachet Majdoor ka ka-kha-ga (ABC of a conscious worker). There was a stress upon workers taking steps on their own, on taking steps collectively. During this time the negative role of unions became more evident for workers in Faridabad. During a lock-out at the Bata plant in Batanagar in 1988, the union at Bata in Faridabad gave active support to overtime work and after two-three months the three day India-wide strike by Bata workers against the lock-out in Batanagar became the news - meaning, the unions first actively undermined workers of a certain location and then engaged in largely symbolic solidarity afterwards. On Mayday central trade unions used to organise separate rallies. Because of a sharp fall in workers membership, unions started joint rallies on Mayday. Even for joint demonstrations the number of participating workers became so small that it gave rise to the farce of 'seminars' by the joint trade union council on Maydays. 34. Workers occupying factories, confrontations with the police, the army using tanks against steel factory workers in Brazil, the use of helicopters against workers in South Korea, textile workers blocking the railroads in Kanpur, the activities of workers in Dalli Rajhara iron ore mines of the Bhilai Steel Plant, more than a year long lockout by the Hindustan Lever management in Mumbai to control workers, Ameteep Machine Tools workers occupying the factory in Faridabad, collective steps of workers in East India Cotton Mill – reports like these became material in the initial years of the new series of Majdoor Samachar. We stressed the importance of daily demonstrations during struggles instead of occasional ones. There were attempts to build forms of organisation that suited workers' self-initiatives. There were joint meetings of workers of different factories, and each time a different person conducted the meeting. Everybody should speak, everybody should learn to speak, so that there is no space for leaders. The study circles and collective meetings made their impact on activities in the factories. This form of organisation, this attempt was appropriate for active workers, but general workers remained outside of this process. These attempts made active workers more active. 35. Visiting Kanpur, Dhanbad, Rourkela, Bokaro, Durgapur, Birbhum, Kolkata, Nagpur, Mumbai, Pune – all big industrial centres in North India - and other places to have political discussions. In Kolkata, some friends initiated a collective study of Capital, however, it could not be pursued much further. On the suggestion of friends in Kolkata there were attempts to initiate an all India workers' newspaper in Hindi. Year-long efforts succeeded. 32 organisations gathered in Dalli Rajhara. Shankar Guha Niyogi arranged for the lodging and food. There were extensive discussions for three days among anarchists, Trotskyists, Stalinists, Maoists, Leninists, Marxists and those who took Marx as a point of departure. A consensus emerged. It should be published monthly. Twenty thousand copies. It should be distributed in those major industrial areas where workers understood Hindi. How many copies were required for which place was decided. Only reports of workers struggles will find place in the newspaper. Each organisation should continue to publish their analyses in their respective publications. There will not be any analysis in the all India workers' newspaper, only struggle reports will be there. The points of consensus will not be open for discussions or amendments. We should welcome and try bringing new people on the basis of these consensus points. Three months later we would again meet in Dalli Rajhara to decide upon the technical aspects. People from 32 organisations signed on the agreement-paper. Shankar Guha Niyogi said he would bear the expenses of the first two issues. When we met three months later, a friend from Punjab demanded a rethink over the points of consensus. When the signed agreement paper was shown a friend associated with Niyogi called this 'the politics of a particular organisation' and advocated to include the reports of peasant struggles along with those of workers. A member of one of the signatory organisations from Bengal talked about signing the agreement sheet in haste and declared workers-peasants alliance as the fundamental political premises. That attempt to have an all India workers' newspaper failed because a friend associated with Niyogi wanted to have a fresh discussion on the points of consensus. Some days later Shankar Guha Niyogi was killed in the Bhilai Industrial Area by goons of the industry. 36. There used to be a column entitled "Marxism" in the new series of Majdoor Samachar. Experiences of interactions with many types of political organisations and activists, i.e. discussions with the five percent of the population raised questions on their importance. The issue of wasting time and energy emerged. The need was felt to have a new language that addressed the 95 percent and confronted with the problem of perceiving revolution cataclysmically as sudden explosions a new imagery for fundamental social transformation was needed. Since March 1993, the usage of words like capitalism, imperialism, socialism, Marxism was stopped in Majdoor Samachar. Efforts began to use sentences-paragraphs to say what one wanted to say with these words. *** Restructuring struggles at Escorts and Gedore: questioning the concept of the ‘advanced worker’ or ‘militant figure’ and turning towards workers’ general experiences. 38. In December 1993 we pushed ourselves and printed 4000 copies of Majdoor Samachar. The main matter was Escorts Majdooron se Thodi Gupshup (‘Some lighter conversations with Escorts workers’). Young comrades presented the facts in an engaging manner – in support of workers, but that hit the raw nerve of the management and the union. After having distributed the paper at other Escorts plants, when we were distributing the newspaper at the Escorts' Yamaha Plant, any semblance of union democracy collapsed and copies of the newspaper were seized. From then on increasing the print-run to at least 5000 copies monthly became extremely necessary... and we have been able to sustain that during the following months. After acquiring Kelvinator, the company, Whirlpool,  knit such a mesh of fear and greed that 2500 workers were thrown out of their jobs in one go. On this issue the independent union acted as if it was a department of the company. Management's propaganda bubble of offering "big golden handshakes" burst within a year when the retrenched workers were desperately ready to toil for a meagre 1500 rupees. The discussions (also documented in the newspaper) of the bitter experience of Kelvinator-Whirlpool workers made it difficult for management in other factories in Faridabad to retrench large groups of workers in one stroke. In Escorts, after restructuring, a process of re-engineering took place; new machines were placed in the new halls. Then a long-term agreement between the management and the union that meant a large-scale retrenchment of workers was signed. The plan of dismissing workers in one go by engineering a strike was foiled by workers chasing away the union president. Even the supervisors and managers frustrated the attempts of their own dismissals by taking a cue from the workers and by staying calm. Escorts workers did not fall for the voluntary retirement scheme, even when redundancy payments were increased initially from 45 days pay for each year of completed service to 70, then 90, then 105 days and finally to an offer of full-wage payment till the retirement age of 58 years. The management was forced to adopt the path of stopping new recruitment and slow retrenchments. During this time Majdoor Samachar used to be called Escorts Samachar. 39. From 1996 onwards, workers of Jhalani Tools (Gedore) raised new questions. The management had stopped paying wages. Workers harassed officers in the labour department by going there in affinity (solidarity) groups, but wages were not paid. Even the head of the civil administration in the district, the DC, was troubled by workers affinity groups in his office, but wages were not paid. The DC himself took the matter to the District Complaints Redressal Committee, which was presided by a minister, but with no result. Workers sent their complaints to the State and Central labour ministers, Chief Minister, Prime Minister, President, but still could not obtain their wages. Production continued in the factory, many months' arrears piled up. When friends asked for legal advice, they were told by a senior advocate in the Supreme Court that if a company is not paying the wages, you cannot get them through any legal recourse. What to do? It was suggested that workers convey their problems to workers in other factories by writing on placards and displaying them. At the beginning and end of the shifts, affinity groups of workers stood in turns displaying these placards at a ten-yard distance, workers were seen displaying them for around 200-500 metres away. Many types of discussions took place. Some of them have been recorded in Majdoor Samachar. People started talking about Jhalani Tools (Gedore) workers in thousands of factories in Faridabad. "One factory management is disturbing the environment for thousands of factories." In order to contain the disturbance, the state government after a meeting in Chandigarh produced leaders from amongst the workers through an election, and the payment of wages started after 21 months. 40. Experiences overturned many of our assumptions. The limits of the assumption that "Exploitation is due to ignorance, knowledge will liberate from exploitation" became very visible. Circumstances seemed to prevail by knowingly doing wrong. The assumption that ‘we know and we have to teach the workers’ was questioned many times in our practice. How workers deal with circumstances and what are the limitations of their methods, what can be done to remove these limits – such realisations gave new importance to the need for learning from workers. After 1998, what workers were saying got more space in Majdoor Samachar and our importance started decreasing. Some friends found this very upsetting but what workers were saying made up an increasing share of the newspaper. 41. By 2000 factories in Faridabad and the workers inside the factories had changed a lot. On looking back at the 1990 - 2000 period, it doesn’t seem like ten - twenty years ago, rather it seems ancient. Yes, during that period the multi-facetted discussions in Majdoor Samachar on unity versus talmel (collectivity) seems to have become even more important today. Not 'talmel and unity', but rather 'talmel versus unity' is of extreme importance today in the context of the question of what to do and how to do it. Unity leads to the system of representation, of turning 100 workers into 5 (leading) workers; it is based on the rejection of the uniqueness of each person, whereas collectivity is premised on everyone's importance. Collectivity is the path to being unique and together and to a process of turning 100 into 1,000 - 10,000… Today the majority of workers in factories are temporary, a single product tends to be manufactured in many factories together, car factories have been turned into auto-hubs; we have seen the emergence of industrial zones with thousands of inter-connected factories replacing factories standing apart from each other; and there are deepening links between factories on a world scale - all this seems to make talmels an effective method for workers of the world to bond together. 42. We were satisfied in our small world wherein we remained focused amongst factory workers in Faridabad and engaged in forming minor bonds-contacts throughout the world. Friends in Okhla Industrial Area (Delhi) pulled us towards them. In 2005 metal polishing workers employed by Michael Aram Exports took the experience of Jhalani Tools (Gedore) workers talmel and their effort to turn their own factory issue into an issue of many factories as a point of departure. After wages had not been paid they went amongst other workers in Okhla and other areas of Delhi with hand-written placards. It made an impact. But just as the impact during the Jhalani Tools dispute would not have been enough if limited to just Faridabad, a similar situation would have probably developed during the Michael Aram dispute in Delhi. Also, in comparison this factory was quite small. But here a pleasant coincident occurred. The production of Michael Aram Exports took place here and the products were sold in the USA. Friends in the USA took action in front of shops there, impacting negatively on sales, while workers here impacted on the place of production. The plan to close the factory, get rid of all workers and establish a new factory for the same work was thwarted by the talmel between workers in Okhla and friends in the USA. Five months of joint activities forced the company to give permanent jobs in the new factory and pay outstanding wages. Worldwide reality of production and distribution has made it an indispensable necessity even for defensive measures in daily life for workers throughout the world to form bonds amongst themselves. 36. Another friend who had arrived in Gurgaon  forced us to come there. Until 1995 Gurgaon was a very small industrial area, but by 2005 it had become a bigger industrial centre than Faridabad. IT and BPO offices (call centres) and factories stand side by side. In 2005 a write-up based on three conversations with a worker hired through a contractor about the situation at the Gurgaon Honda factory was published in Majdoor Samachar. In 2007 the friend motivated us to distribute Majdoor Samachar at the gates of Honda in IMT Manesar and at Delphi  bordering the National Highway 8. The collective steps of the workers hired through contractors at Delphi amazed and motivated us and some of the workers developed close relations with Majdoor Samachar. The details of their activities were published. Since then the factory has been relocated. In 2007 the 4,500 workers hired through contractors at the Hero Honda spare-parts factory in Gurgaon stopped work and staged a sit-in inside the factory for several days. Then, against the three-year agreement between management and the union at Honda, workers hired through contractors engaged in a planned sit-in inside and outside the factory. But it was the numbers of workers in Gurgaon Udyog Vihar that forced us to increase the amount of printed copies from monthly 5,000 to 7,000. Another friend started working in factories in IMT Manesar and we started distributing the paper there, too, printing 8,000 copies per month. Then the miracle of the Maruti Manesar workers  raised the number of printed Majdoor Samachar to 10,000. *** Conclusions: tragic failures and starting-points of the past and what kind of organisation can involve the active participation of seven billion people in the present and near future? 44. For a long time, the form of organisation for organised practice in various areas has remained a knotty problem for us. In this context we have made many attempts and have found them inadequate. On the question of organisation we find Lenin's stress on distinctness as a point of departure. We see Luxemburg's loyalty to the party  as keeping together mutually antagonistic ideas, as providing shelter for indistinctness, which in the situation of upheaval drowns the forces of social transformation. Distinctness. Practice for the verification of premises. Distinctness anew. Practice anew for the verification of new premises. We hope that the knotty problem of the form of organisation in various areas will get solved in this process. 44(a) It seems to us that ladder-pyramidal forms of organisation are part of the problem, rather than the solution. The Paris Commune , the Soviets  and the First International  seem to us to be providing points of departure for forms of organisation. We are confident that the knotty problem involved in the creation of a new society by the human species can be solved by the active participation of increasing numbers of people in the social churning. This is why we consider the formation of a standing army in the Soviet Union in 1918 as a fatal blow to the possibilities of creating a new society. This was a tragedy. Instead of some conspiracies we consider social indistinctness (lack of clarity) as the reason for this. Once private property and capitalists were considered to be the essence of capital and abolition of private property as the fundamental step in the creation of a new society then the (ideological and practical) ground for the establishment of state capitalism as a step towards socialism was paved. The defence of state capitalism provided the basis of the acceptance of a standing army as a temporary necessary evil. Standing armies and the secret organisations necessary for it initially stopped the increase in the number of people actively participating in the social churning and then shrunk their numbers. The important question is not whether the control of the standing army is in the hands of Lenin or Stalin or Trotsky or in the hand of Khrushchev. The issue is not whether Lenin was right or wrong, what is important is the stopping of the active participation of increasing numbers of people. The social process was increasingly bringing to the fore the necessity of creation of a new society... and the Great Depression of 1928 in these circumstances (e.g. of the degeneration of the revolution in Russia) led to the mass slaughter of 1939-45 instead of moving in the direction of creating a new society. The materialist interpretation of history has its limits but when those who claim to be familiar with Marx say things like: up to Lenin it was right, or up to Stalin it was right, or the defeat of Trotsky was wrong and if Trotsky had won everything would have become right, Khrushchev ruined it all... then it seems that they are completely unaware of the contribution of Marx to the materialist interpretation of history. China was socialist while Mao was alive and as soon as Mao died China became capitalist - what to say to these? 44(b) The limits of craft-trade based organisations of workers was seen even in the middle of the 19th century. But these trade unions took care of the economic and working condition-related interests of their members. Against workers' interests the role of these trade unions in the slaughter during 1914-19 raised anew the question of mass organisations of workers. Workers organisations on the basis of factory, industrial unions were seen as an alternative to craft-trade based organisations. In Faridabad instead of craft-trade unions we have been facing factory-based unions and some expositions regarding their role have already been given in this presentation. After 2000 the question of mass organisation of workers has arisen anew. In factories 12-hour shifts instead of 8 hours have become common. 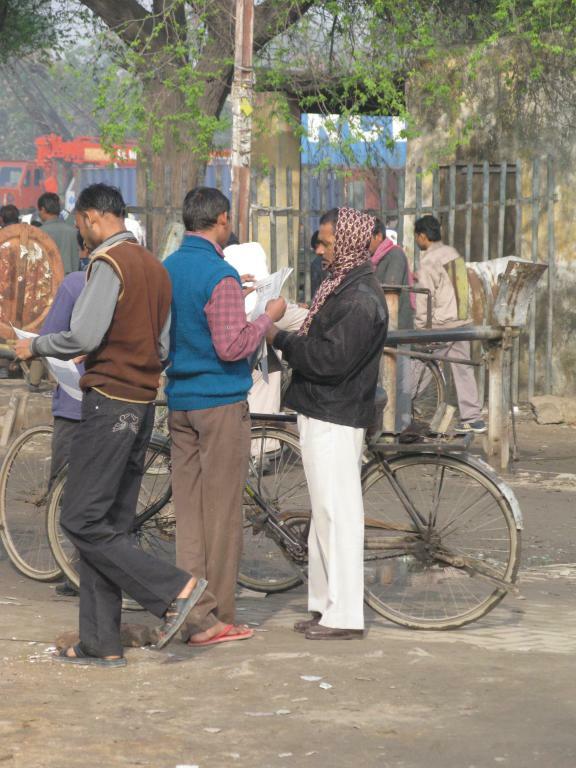 For organisation in these conditions we tried "Faridabad Samachar Talmel". To contribute to workers taking steps collectively rooms were rented as part of “Faridabad Samachar Talmel” in Okhla Industrial Area, in Kapashera close to Udyog Vihar in Gurgaon, in Rampura near IMT Manesar and in Faridabad for workers to meet at ease (Baithak). With our extremely limited means, efforts over a year did not take us forward at any place. Some exposition on this experience is published in the August 2011 issue of Majdoor Samachar. An organization that is not based on one factory alone, but has its basis in the whole industrial area, an organization not only for permanent workers, but for all (permanent and temporary) workers – even today it seems difficult to imagine how such an organisation could be established. Factory-based workers' groups and talmel amongst these groups on the basis of industrial area might be the key. For verification practice is needed. Maruti Suzuki Manesar workers have posed the question regarding the form of organisation appropriate for organised efforts today with new intensity and sharpness. We are face-to-face with the possibility of talmel (coordination) between permanent and temporary workers in the factory, talmel between workers of factories in an industrial area, talmel between workers of different industrial areas and talmel between workers throughout the world and to give concrete form to this possibility should be the essence of one's activities. The social relation coming to the fore in shapeless form has brought about the tragedy of the whole of human species. The social churning going on amongst seven billion people for the formation of a new society is increasing the possibility of talmels between seven billion people. The antagonistic relations between accumulated labour and living labour that emerged in a few regions on the earth some thousands of years ago have reached that stage today where not only the human species but rather life of all living species is at stake. This antagonism between dead and living labour has polluted air, water, soil on earth on a big scale and the process of stock-piling means of destruction at a rapid pace is increasing even in outer-space. Creation of a new society wherein there will be harmony in place of antagonism between dead and living labour is on the agenda of the human species. The complexities, multiple dynamics, multiple realities are such that even in physics it is probabilities, possibilities, densities. We were right, we are right, we will be right are the premises of sects and orders. This auto-critique was presented to left-wing activists and left-wing students. This English translation will, hopefully, generate a better response than its presentation in Hindi. After this presentation in May 2012, on 18th July 2012 young workers in the Maruti Suzuki care factory in IMT Manesar, on the outskirts of Delhi, rejected, en masse, concessions that would be considered very significant by any standards. Thousands of wage-workers rejecting significant concessions and attacking two symbols of the wage system, managers and factory buildings, us of global significance. In this context it seems that some of the points presented in May 2012 are even more relevant today. Party founded in 1969 after the Naxalbari uprising in West-Bengal. It followed a Maoist trajectory of armed peasant uprising against ‘feudal relations’ in alliance with workers and national bourgeoisie for a ‘democratic revolution’. The state in India reacted with a wave of mass repression, killing hundreds of militants. Various splits occurred during the early 1970s. Since then the ‘Maoist movement’ has developed along three main tendencies, a ‘populist’ electoral tendency, namely in form of the CPI (ML) Liberation; guerrilla organisations that maintain the position that India is semi-feudal, namely in the form of CPI (Maoist); and various factions, which focus on industrial workers and see India as a capitalist country, namely in the form of various factions of the Communist League of India (CLI). Prime Minister Indira Gandhi declared a State of Internal Emergency in June 1975, it lasted till March 1977. Under the blanket of the Emergency mass arrests, slum demolitions, sterilisation campaigns and factory restructuring intensified. Comrades of GurgaonWorkersNews wrote up a historical account of the prelude to the State of Emergency – namely the ‘popular’ Bihar Movement - and of the upsurge in workers’ unrest after the end of emergency. The Communist Party of India was founded in the mid-1920s and has since then followed the usual tactical twists and turns of most CPs: during the Second World War they called the Indian people to support the colonial British army in their fight against ‘fascism’; after ‘Independence’ they disarmed peasant uprisings, such as in Telangana, saying that it is time for national democratic re-construction rather than for revolution; and in the 1970s the party supported the governments call for an internal State of Emergency, again using the bogey-man of a ‘fascist threat’ as justification. The CPI is fairly irrelevant nowadays. The CPI (M) split from the CPI in 1964, partly due to the fact that the CPI supported the Indian government during the India-China war of 1962, as part of the patriotic ‘independent’ nation building. The CPI (M) quickly became a governing party itself as a ruling party in West Bengal and Kerala and by 1967 allowed the central state forces to militarily suppress a peasant uprising in Naxalbari, West-Bengal. Under the CPI (M) government, West Bengal became the Indian state with the second highest share of foreign direct investment and CPI (M) cadres brutally oppressed movements opposing land grabs for industrial development. A Stalinist party founded in 1948, calling for ‘socialist revolution’, instead of democratic re-construction or democratic revolution. In conversations the comrade pointed out that although the booklet was written as a critique of the middle-men position of the existing trade unions, it seemed that within the trade unions and their representatives the booklet was appreciated; this fact was later on interpreted as an indicator that the booklet’s Leninist criticism of 'trade union bureaucracies' only scratched the surface of the problem – editor. Shankar Guha Niyogi (14 February 1943 – 28 September 1991) was founder of Chhattisgarh Mukti Morcha (CMM), a labour union run in the town of Dalli Rajhara Mines in Chhattisgarh. He was killed by industry goons in Bhilai industrial area. The Narodniks were a ‘populist movement’ in the late 19th century in Russia, largely organised in underground cells. They focussed on the peasantry as a force to over-throw the Czarist regime. They maintained that the system in Russia was economically and politically qualitatively different and that a ‘Russian’ way of revolution had to be found. In this sense their politics tended to be a mixture of petty-bourgeois radical liberalism and populist patriotism – trends which also prevail within the various communist parties in India. In the Hindi original a pun is used: ‘From 1947 onwards, companies were free from the responsibility of providing for workers' housing.’ The word ‘free’ here is the same as ‘independent’, which refers critically to the 'anti-colonial' notion of national independence, meaning: with ‘India’s Independence’ in 1947 the employers became independent/freed from having to provide housing for workers - editor. “The police-force itself was not too reliable at that time – a clear sign for the depth of social discontent. The lower ranks of the police were badly paid and had to work long hours. In Faridabad they went on strike. Some of them were from Kerala and we got in touch with them. In the end they had to bring in the special police force CRPF. They sacked half of the local police and the CRPF disarmed the other half. We put up posters “Police against Workers – CRPF against Police – Army against CRPF: This is Indian Socialism!”. Strike in Bombay textile mills from 1982 – 83, involving over 250,000 workers. It was clear that the industry would go for a radical re-structuring process, bringing in automation of the spinning process and detaching it from the weaving process, which was outsourced into an ‘informal’ work-shop sector. The strike led to an acceleration of this process and quicker mass-dismissals of thousands of workers. The union’s decision to send striking workers home to their villages, instead of increasing the urban unrest, played into managements’ hands. A very small political party, hardly more than 1,000 members. The RSP-ML split from the RSP in 1969, critical of the parliamentarist turn of the latter. It remained a fairly small political organisation, mainly composed of skilled workers in the old industries like mining, steel manufacturing or the railways. The party emphasises ‘the revolutionary program’ and the ‘development of class consciousness’. Trade unions are regarded as capitalist institutions, which divert class struggle into economism and they see Trotzkyism, Stalinism and Maoism as bourgeois deviations. Despite the – compared to other communist parties – very working-class base of the party, their monthly party organ ‘Kranti Yug’ (Revolutionary Era), hardly reflects the proletarian experience of the organisation and mainly focuses on ‘general politics and their communist interpretation’. One of the main three tendencies which split from the CPI(ML) in the late 1970s, the CLI maintains that India is capitalist and that the workers are the main revolutionary subject. The CLI split into various other factions, e.g. the CLI(ML). Trotskyist party from the UK, founded in the mid-1960s. They tried to work from within the Labour Party (entryism) and dominated the Liverpool City Council in the mid-1980s. The majority of the party later on founded the Socialist Party. Left-communist organisation, largely based on ‘programmatic positions’ without much deeper analysis of day-to-day struggles and changes within the social production process. Council communist, who wrote mainly on the question of (self-)organisation of workers and crisis theory. Council communist group of the 1960s/70s based in the UK. Bolshevik, supporter of the New Economic Policy, which increased pressure on workers in Soviet Russia and demolished the power of the soviets. Later on executed during the Soviet trials. Pamphlet by Kamunist Kranti on the critique of the political economy. British merchant company founded in 1600, operating its own armed forces. Organised and enforced the colonial trade, amongst others the opium trade between Britain, India and China. Forms of land taxation in cash or kind existed long before the British colonial state entered India. The British Zamindari system was introduced by Lord Cornwallis in 1793 with a view to increasing the revenue of the East India Company. Under this settlement, the landlords were recognized as the full proprietors of the land. The task of collecting rent from the farmers was entrusted to them. The Zamindars became the intermediaries between the cultivators and the State. This is an implicit criticism of common distinctions prevalent amongst Maoists into ‘national bourgeoisie vs. international bourgeoisie’. In their view alliances with the national bourgeoisie are necessary in order to proceed with the democratic revolution – editor. Again, this is a criticism of romantic notions about indigenous tribes in India being self-sufficient and outside the market relations. The notion of self-sufficiency is the basis for various (Maoist) political strategies, such as the creation of ‘liberated zones’ – editor. Maruti Manesar workers (de-)occupied their factory twice in 2011 and attacked it in 2012. When the text talks about ‘Lenin’s distinctness’ it does not refer to the later Bolshevik party formation during the Russian revolution, but the break from social democracy from 1902 onwards. Luxemburg tried to keep working from within the SPD, even after the party rallied behind the German state and industrial class during the prelude of the First World War - editor. Insurgent experiment of working people to organise their own lives. We are face-to-face with the possibility of coordinations between workers of factories in an industrial area and coordinations between workers throughout the world and to give concrete form to this possibility should be the essence of one's activities. I look forward to reading this. The WSA was in touch with KK as they were emerging out of the traditional marxian movement. Always very interesting in their general mass work. Their theoretical stuff was beyond my personal comprehension level (as is most theoretical stuff). I can't recall what we circulated of theirs, it might have been some strike or workplace stuff. Long ago. I'll have to look at the files. Anyway, look forward to a read. I personally think there is still much to be inspired by the council communist and anarcho-syndicalist tradition. also what are comrades position on crisis theory? this was a pretty interesting footnote too (on indian CPs) http://www.union-communiste.org/?EN-srch-show-x-6-1520-6192-643e7c035db43a3e1de06e438fb53c63.html can i put it up even though it's Trotskyist?